Today, May 27, we celebrate the feast of Saint Augustine of Canterbury (sometimes referred to as “Saint Augustine the Lesser,” died 605), called the “Apostle of England,” and the eventual first Archbishop of Canterbury. Not to be confused with his namesake, Saint Augustine of Hippo, the work of Saint Augustine of Canterbury is widely regarded as the birth of conversion in England, beginning the slow process of conversion of Celtic tradition and reconciliation with Rome. 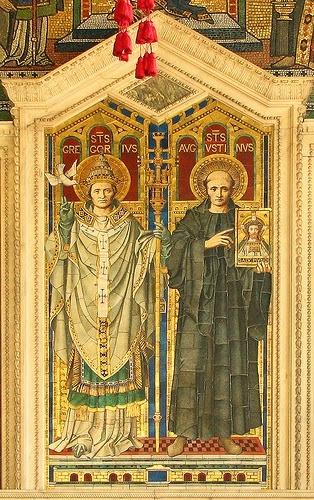 Much of what is known of Saint Augustine of Canterbury is taken from letters written by Pope Saint Gregory the Great, and through the written ecclesiastical history of England written by Saint Bede. Little is known about Augustine’s early life. We join his story as he serves as Prior of a Benedictine monastery of monks in Rome, during the papacy of Pope Saint Gregory the Great. In 596, when historians suggest that Saint Augustine was already past middle age, he was sent by the pope, with a delegation of approximately 40 monks, to England to preach the Gospel. News of the ferocity of the Anglo-Saxons, and their treatment of Catholics, was widespread, but with encouragement—and out of obedience—Augustine undertook this difficult and potentially dangerous mission… but not before returning to the Pope and seeking reassurance. Pope Gregory provided encouragement, stating, “Go on, in God’s name! The greater your hardships, the greater your crown. May the grace of Almighty God protect you, and permit me to see the fruit of your labor in the heavenly country! If I cannot share your toil, I shall yet share the harvest, for God knows that it is not good-will which is wanting.” Upon reaching England, following a difficult crossing of the channel, Saint Augustine announced their arrival to King Ethelbert of Kent, telling him they brought the message of eternal life. King Ethelbert was a pagan, although he had married a Christian, his wife, Bertha. On her request, he promised to receive the monks and consider their message. Saint Augustine led the monks in procession to the king, carrying a silver cross and singing litanies to God for the salvation of this people. King Ethelbert allowed them to sit and share the Good News with him, which was unexpected. Augustine, following his initial success in England, traveled to France, where he was consecrated as a bishop, and subsequently returned to Canterbury to establish a vigorous community of religious life. With him he brought a priceless collection of illuminated manuscripts, still present and preserved today. He reconsecrated and rebuilt a church at Canterbury, and founded the monastery of Saint Peter and Saint Paul Outside the Walls (now sometimes known as Saint Augustine’s). He is further credited with founding the King’s School at Canterbury, the world’s oldest school. The remains of some of these early buildings remain near the now famous cathedral, built in later years at Canterbury. Augustine followed this directive, encouraging his monks to do the same. Even so, by the time of Saint Augustine’s death in 605, the work of evangelization of England had only just begun. It is believed, however, that he lay the groundwork for the eventual spread of Christianity throughout the kingdom. Augustine was obedient and steadfast, despite meeting many obstacles. He lived the Benedictine doctrine of “presence, not confrontation” in preaching the Gospel. His perseverance, in the face of opposition and difficulty, is inspiring even today. He was a man of humility, who doubted his ability to make small decisions, seeking counsel and writing to Pope Gregory for reassurance and advice. He truly followed the advice of his counselor, who wrote: "He who would climb to a lofty height must go by steps, not leaps." Augustine died after just 8 long years, toiling in England. He was buried in Canterbury, at the monastery he founded. Throughout his life, Saint Augustine of Canterbury realized that he was but one man, who reported to a higher authority. He sought guidance from Pope Saint Gregory during his times of great difficulty, turning to God whenever he met obstacles (which were all too frequent!). The great pope sent many letters of support and spiritual counsel, including the one excerpted here: Glory to God in the highest and peace to his people on earth, because the grain of wheat has fallen into the earth and has died. Christ has died in order to reign in heaven. Not only that: by his death we live; by his weakness we are strengthened; by his passion we are freed from suffering; impelled by his love, we are seeking in Britain brothers whom we do not know; through his help we have found those for whom we were searching, although we were not acquainted with them. Who, dear brother, is capable of describing the great joy of believers when they have learned what the grace of Almighty God and your own cooperation achieved among the Angles? They abandoned the errors of darkness and were bathed with the light of holy faith. With full awareness they trampled on the idols which they had previously adored with savage fear. They are now committed to Almighty God. The guidelines given them for their preaching restrain them from falling into evil ways. In their minds they are submissive to the divine precepts and consequently feel uplifted. They bow down to the ground in prayer lest their minds cling too closely to earthly things. Whose achievement is this? It is the achievement of him who said: My Father is at work until now and I am at work as well. God chose illiterate preachers and sent them into the world in order to show the world that conversion is brought about not by men's wisdom but rather by his own power. So in like manner God worked through weak instruments and wrought great things among the Angles. Dear brother, in this heavenly gift there is something which should inspire us with great fear and great joy. For I know through your love for that people, specially chosen for you, that Almighty God has performed great miracles. But it is necessary that the same heavenly gift should cause you to rejoice with fear and to fear with gladness. You should be glad because by means of external miracles the soul of the Angles (English) have been led to interior grace. But you should tremble lest, on account of these signs, the preacher's own weak soul be puffed up with presumption; lest, while seeming externally raised aloft in honor, it fall internally as a result of vainglory. We should remember that when the disciples on their joyous return from their preaching mission said to their heavenly master: Lord, in your name even devils were subjected to us, he immediately retorted: Do not rejoice about this but rather that your names are written in heaven. The life of Saint Augustine of Canterbury reminds us that we all need the support of those around us, and more importantly, the grace of God to persevere in our daily lives. We are confronted each day with obstacles—many quite small—but some which seem insurmountable. We have ample opportunities to turn from our faith, to give up, to give in. Saint Augustine’s obedience and zeal for his work, accompanied by the patient counsel and encouragement of Pope Saint Gregory, remind us that the Lord provides the support we need to accomplish great things—both in heaven and on earth. We may not always seek that support. We may not even be aware that it exists. Or it may come from the most unlikely of places (like a pagan king intrigued by the Gospel!). When we are lost and confused, we are reminded that we are not alone, and have the Lord to assist us in taking our steps (not leaps) toward the achievement of His lofty goals for each of us! by the preaching of Saint Augustine of Canterbury, you led the people of England to the Gospel. May the fruits of his work continue in your Church. Grant that through his intercession, the hearts of those who err may return to the unity of your truth and that we may be of one mind in doing your will. Help us to work in a spirit of trust and love, as well as a spirit of prudence and understanding, so that we may grow as God’s faithful. May harmony reign ever among us. Because of your example in living the Gospel, we dedicate ourselves,through your intercession, to live that same Gospel. Implore on our behalf the favor of an ever-deepening trust in God’s goodness and love. Obtain God’s grace for us that we may grow in faith, hope, love and all virtues. Grant that by imitating you we may imitate our Lord and Master, Jesus Christ. Watch over us and help us to reach that place where you live with all the saints for ever and ever. Amen.